When you need a new look for your furniture or suite, loose covers provide a practical and cost-effective solution. Created from the fabric of your choice, your loose covers are tailored to exactly fit your furniture. Because loose covers can be easily removed, keeping them clean and fresh is simple. 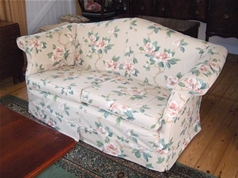 Depending on your choice of fabric, your loose covers can be washed or dry cleaned. This makes loose covers the ideal solution for furniture which gets a lot of wear, or for lighter coloured fabrics. If you want a specific fabric from a supplier not listed by PH Upholstery, simply ask and the PH team will try to source it for you. Alternatively, if you would like to use your own fabric for your loose covers, PH Upholstery will be pleased to advise you on the amount of material you need. All the fabric supplied by PH upholstery for loose covers is fire retardant and complies with the current regulations (Furniture and Furnishings Fire Safety Regulations 1988). Different grades of fire retardant fabric are available, depending on your individual needs and where the loose covers will be used. 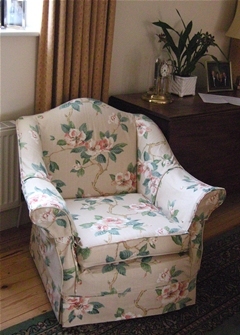 For more information or for your free loose cover estimate, phone PH Upholstery today on 01993 831702. If you prefer, you can send your loose cover enquiry by email.